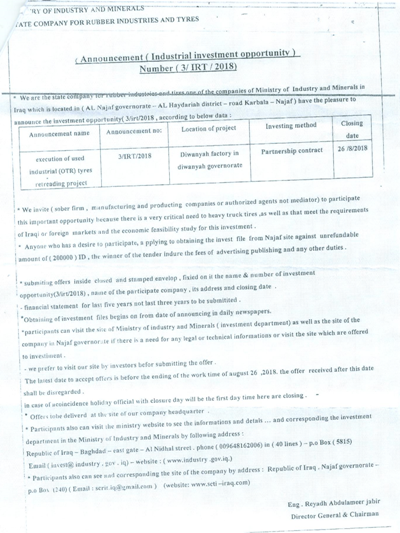 Posted in Business, Commission, featured, Investment, Investment Opportunities, mn, National Investment Commission (NIC), State Company for Phosphates. 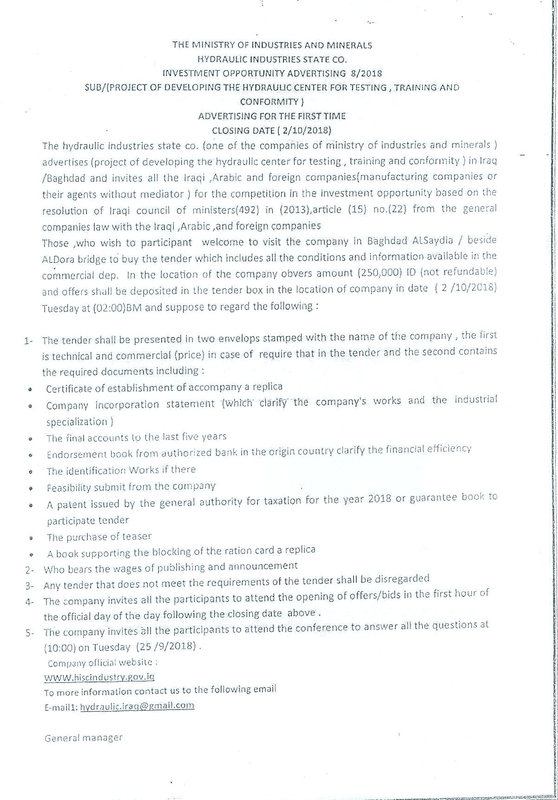 Posted in Business, Commission, Electricity In Iraq, featured, General Company for Communications Equipment and Power, Investment, Investment Opportunities, Iraq Industry & Trade News, mn, National Investment Commission (NIC). The National Investment Commission (NIC) and the Iraqi Civil Aviation Authority (ICAA) have announced the investment opportunity to build Nasriya International Airport. The airport is located to the south–west of Imam Ali (PBUH) air force base in Thi Qar province. The area of the passengers terminal is 3000m². Interested foreign and local companies can apply by filling the investment licenses available on our website and submit all required documents to our email address info@investpromo.gov.iq within 45 days from the date of announcing this advertisement. Posted in baghdad, Commission, Construction & Engineering In Iraq, Dhi Qar, featured, Investment, Investment Opportunities, Iraq Civil Aviation Authority (ICAA), Iraq Transportation News, mn, Nasiriyah, Nasiriyah Airport, National Investment Commission (NIC). Educational Research Center and Environment Laboratories within the main university site area of 1300 m² plot number 1/3474 m 17 Tajia. The Central Student Club of the University of Babylon within the main university site with an area of 2000 m² plot number 1/3474 m 17 Tajia. Medical Research Center and Specialized Educational Laboratories within the university’s main site with an area of 2900 m² plot number 24/17859 m 17 Waseya. Educational swimming pools with multi-purpose hall within the main university site with an area of 12500 m² plot number 1/12908 m 17 Tajia. Those who wishes to invest in the above-mentioned investment opportunities can visit Babylon Investment Commission to review the special requirements of each opportunity, knowing that applications are accepted until the end of official working hours on Wednesday 5/12/2018. Posted in Babylon Investment Commission, Business, Commission, featured, Investment, Investment Opportunities, National Investment Commission (NIC). 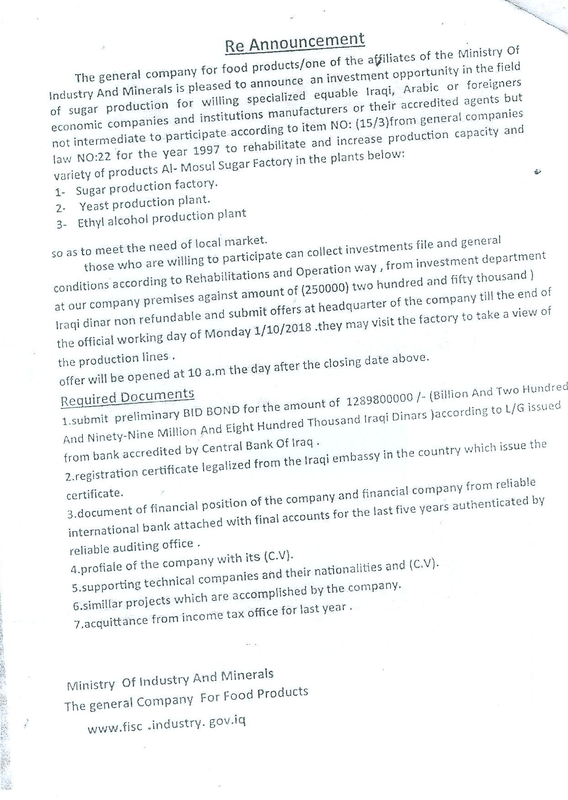 Posted in Business, Commission, featured, food processing, Hydraulic Industries State Company, Investment, Investment Opportunities, National Investment Commission (NIC), State Company for Food Products. Posted in Business, Commission, drugs, featured, glass, Investment, Investment Opportunities, Iraq Industry & Trade News, National Investment Commission (NIC), pharmaceuticals, Samarra, State Company for Drugs and Medical Appliances, State Company for Glass and Refractories Industry (SCGR). 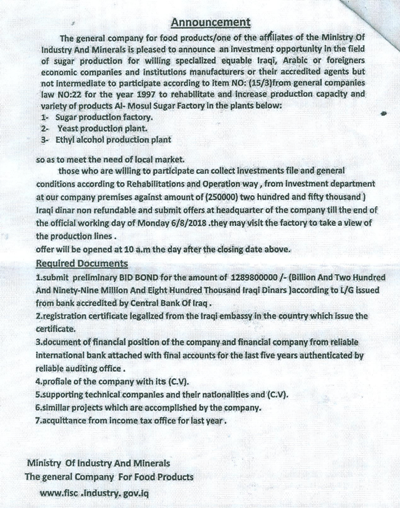 Posted in Business, Commission, featured, Investment, Investment Opportunities, Iraq Industry & Trade News, National Investment Commission (NIC), State Company for Food Products, State Company for Rubber Industries and Tyres, Sugar. Posted in Business, cement, Commission, fallujah, Fallujah White Cement Plant, featured, glass, Investment, Investment Opportunities, Iraq Industry & Trade News, Iraqi Cement Company, National Investment Commission (NIC), State Company for Glass and Refractories Industry (SCGR), State Company for Iron and Steel (SCIS).